This is a very confusing surname. It appears to be of Germanic origins and we have no reason to believe that is not the case, except that as Aberhart, Abrahart and Abrehart, it is not recorded in Grmany. 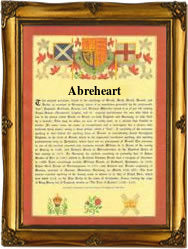 It does appear as Aberhamm, Aberhaus, Aberhorn, and others but the nearest would seem to be Abraht which itself may be a fusing of Aber and Hart, two names found anciently in Germany. Aber was an early pre 7th century personal name which may have meant river, whilst Hart is perhaps even earlier, and was also a personal name meaning heart or mind. Aber is first recorded as a surname in 1348 and Hart or Hartel in much the same period. As Abraht the first recording that we have been able to find is that of Theodorous Abraht who married Catharina Beckers at Dusseldorf, Rhineland, on October 8th 1671. The surname is apparently first recorded in England in 1712 with that of Christopher Aberhart at St Botolphs Bishopgate in the city of London, and thereafter is recorded regularly in the varied spellings in the surviving registers of the city of London.